The Quad City airport is actually named after five cities: Davenport and Bettendorf (in Iowa), and Moline, East Moline and Rock Island (in Illinois). Moline is the home of John Deere tractor. The area was formerly a major industrial hub for American agriculture, but most factories have closed down (Case, International Harvester, Caterpillar). This airport is the third largest in Illinois (behind O’Hare and Midway), as measured in passenger enplanements. In its history, this airport has had scheduled service by many of the domestic airlines that used to exist in the U.S: e.g., AirTran, Ozark, America West, TWA, and PanAm. 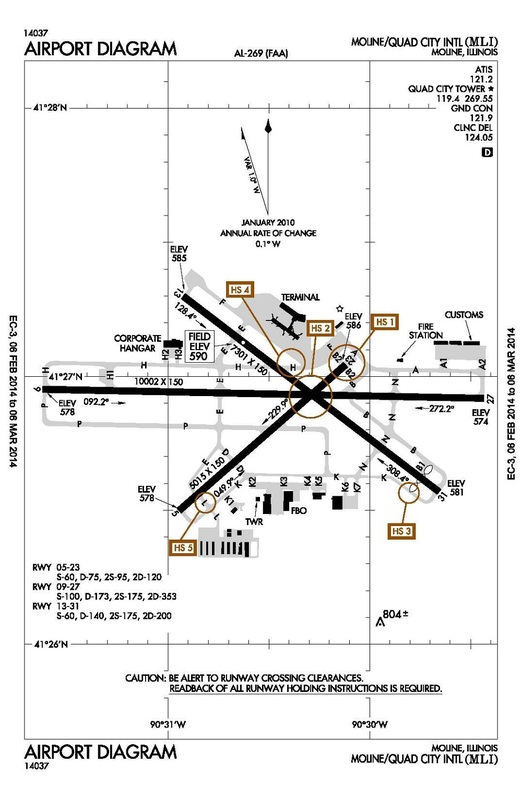 This is a relatively quiet airport, averaging 135 operations per day, served by an FAA control tower open 17-hours each day, and basing only 88 aircraft. But, it also receives lots of FAA grant money. FAA compiles ATADS data for this facility. Airport operations in 2012 were DOWN 26% vs. 2007 operations, and DOWN 56% from the peak year (1991). 3-4-2013 — Quad City Aviation Business Plans Expansion; 50 New Jobs. Two local attorneys are threatening to sue the State if they violate the state constitution by waiving property taxes for Elliott Aviation Services, based at the airport. The tax waiver was intended to support aviation job development, but would take funds away from other community services, such as the schools.